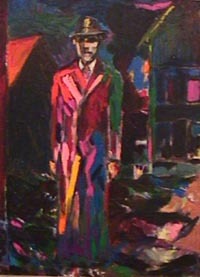 The direct means of color is skillfully used to achieve the artistic expression in the oil painting Boston Blackie. The pink-lit window on the second story of the darkly shadowed house is a light of suspense and caution in this evening composition of colors and delight. A night sky under the tip of what might be a silent pink moon remains mute in its shifting shades of blue and green with touches of pink and bold orange. More and more colors are viewed in the sky until even dark and light reds slowly reveal themselves. There are graduated illuminations throughout this picture.The painter's tones of color produce ingenuities and announcements as shadow and light introduce themselves at unexpected moments of discovery. As in other Cadieux paintings, there are musical sounds hidden somewhere within the pigments of Boston Blackie. Is it a gypsy violin or the full orchestra praise of an invitation to dance and then go on a journey of intrigue, simple pleasure, astonishment of sights never before seen, the adoration of mystery? The musician and composer Todd Ovitt said of the painting, "In the foreground I thought of an orchestra in full color and complex. The background was more of a bass line, a tuba or a bass instrument dark, droning, simple."